Which 7 countries hold half the world’s population? As of this month, the world’s population is 7.63 billion, according to the United Nations, which celebrates World Population Day today. More than half of all people around the globe (3.97 billion) live in just seven countries, according to the UN’s estimates. 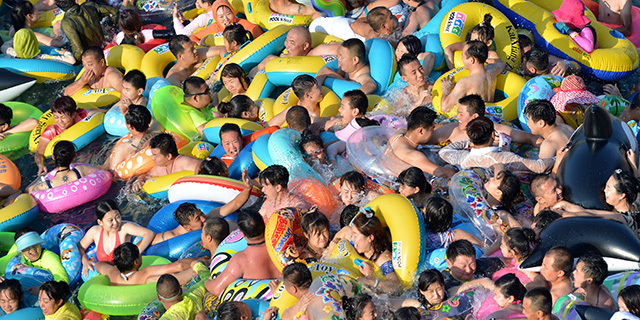 China has the world’s largest population (1.42 billion), followed by India (1.35 billion). The next five most populous nations – the United States, Indonesia, Brazil, Pakistan and Nigeria – together have fewer people than India. 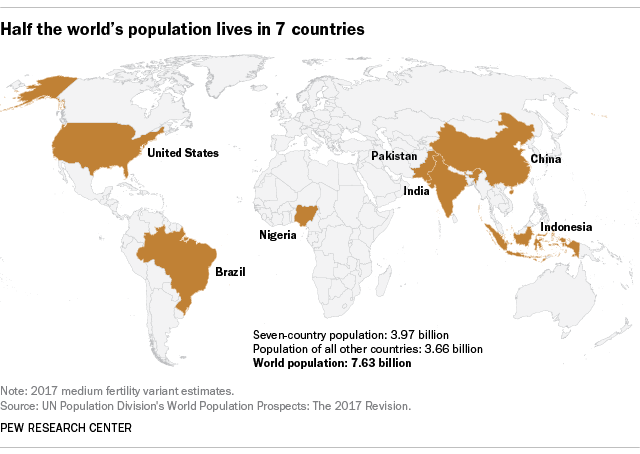 As recently as 2014, half the world’s population was concentrated in just six countries – the same nations as above, with the exception of Nigeria. Recent population growth, however, has been faster in the rest of the world than in these six nations, meaning that the top six now hold slightly less than half (49.4%) of the world’s people. Including Nigeria’s nearly 200 million people puts the world’s seven most populous countries at 52% of the global population. The demographic future for the U.S. and the world looks very different than it did in the recent past. Growth from 1950 to 2010 was rapid — the global population nearly tripled, and the U.S. population doubled. However, population growth in future decades is projected to be significantly slower and is expected to tilt strongly to the oldest age groups, both globally and in the U.S.
During this century, for example, the UN projects that the number of people living to at least age 100 will increase 140-fold, from 150,000 in the year 2000 to over 21 million in the year 2100.